New Caledonia and the New Yorker? From time to time I’ve talked about the little World War II-vintage booklets produced to familiarize Army and Navy personnel with various places around the world that the fight against the Axis might compel them to go. Some of those places are still hot spots, like Iraq. Others were obscure then and remain so today, unless you’re a specialist or someone with an inordinate curiosity about things in general (me). For out of the way places, you can’t beat New Caledonia. This large island in the Southwest Pacific, a French territory only now looking towards a future referendum on independence, is populated by Melanesian Kanaks and French settlers and has an economy centered on nickel mining. 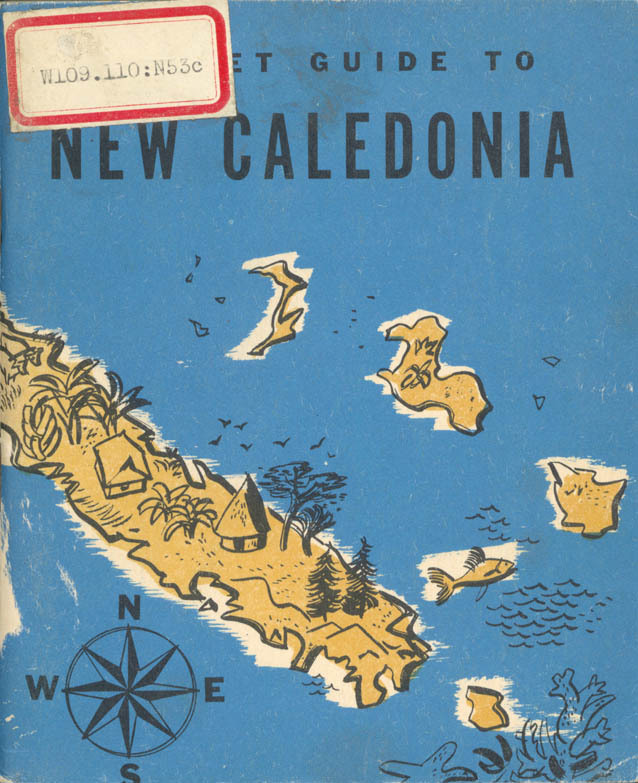 During the war, however, it was the island’s strategic position that made it the subject of a Pocket Guide to New Caledonia. Not long after the fall of France in 1940, the French colonials on the island revolted against their pro-Vichy governor and declared for the Free French, so the island and the harbor at Noumea, the colony’s capital, became a huge naval repair, troop transit, and logistical nexus for America’s armed forces. TheU.S. presence had a huge and generally positive economic, political, and cultural impact on the Kanak population, but stimulated an almost paranoid reaction among Free French officials, who saw the American “occupation” as a threat to their colonial dominance. Clearly, our soldiers and sailors needed some guidance on how to handle these complicated crosscurrents! Like other wartime publications, this booklet also benefited from the work of a well-known artist. 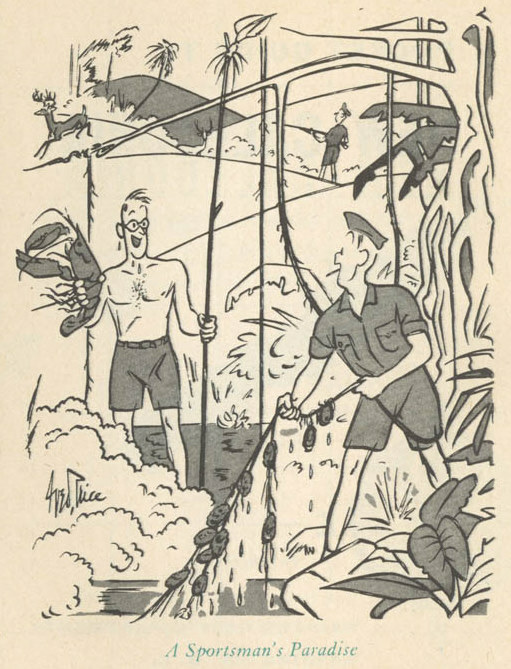 While Dr. Seuss handled malaria prevention, the great New Yorker cartoonist George Price drew theNew Caledonia short straw (see left) and provides a comic glimpse at GI life in the tropics. I enjoyed browsing through Pocket Guide to New Caledonia. The Government did a good job of prepping folks for trips to places that most of them never imagined going, and now we can make the same visit thought these little time capsules. You can read it here or in a library. When I was a kid, I loved to rummage through a bunch of pamphlets that had belonged to my Uncle Teddy. 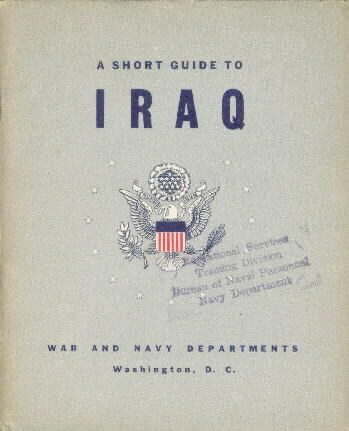 I never knew my uncle because he went missing in action in the Pacific during World War II, so for me his memory was perpetuated mainly by these little U.S. Government booklets about getting along in China, North Africa, Iran, and other wartime hot spots. One of my favorites was “Meet Ann…She’s Dying to Meet You,” a 36-pager about the perils of contracting malaria from the Anopheles mosquito. The illustrations were cartoons, usually showing some poor sap (it’s easy to fall back into the slang of the era) getting bitten by Ann or failing to employ mosquito netting. If you’d like to take a peek at “Meet Ann” online, try this USDA site.